Thom Trimble and I arrived without incident at DIA over 30 minutes early. A strong tail wind helped us along. Since we knew that the risk for severe storms would be in the eastern sections of Wyoming, Nebraska Panhandle and SW South Dakota, we headed for Cheyenne, Wyoming for our overnight. Cheyenne is only 100 miles from Denver, so an easy ride for us. Actually, we had intended to stay in Fort Collins, but every room was gone due to Colorado State University's graduation. 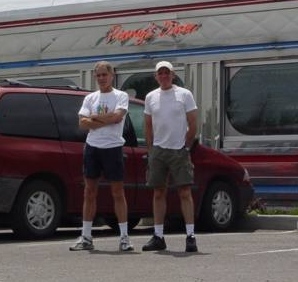 And, actually, we got the last room in the motel area of Cheyenne; things were booked there too for the same reason. After a rambling 10 mile run through Cheyenne, we sat down to decide on a target for the day. (Here is an MPEG (824 MB) of the beginning of our morning trip. 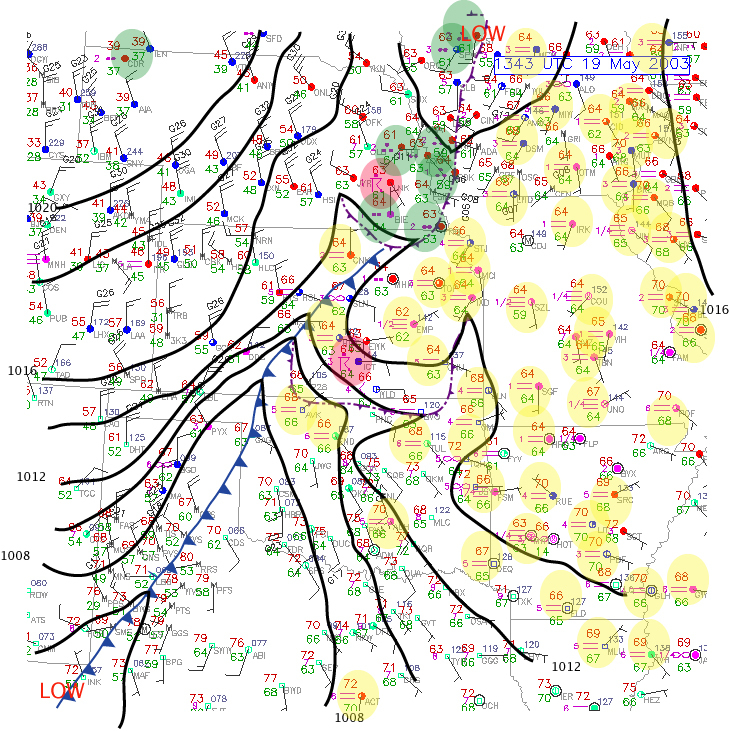 The morning surface chart showed a warm front extending west-east over northern-central Nebraska. Mid-50 dew points were in place south of the boundary...and the afternoon forecast was there for to be moderate shear in the area. Hence, we expected severe storms...and, perhaps, a supercell or two if the shear cooperated, The tornado threat was minimal unless the boundary layer dew points came up a bit. The surface pattern continued to cooperate by mid-afternoon. But as the storms came off of the eastern Wyoming mountains, they developed into a discontinuous squall-line. You can see the outflow boundary develop first in the north and then spread past Scotts Bluff from the western storms on the line. Then many strong storms developed. 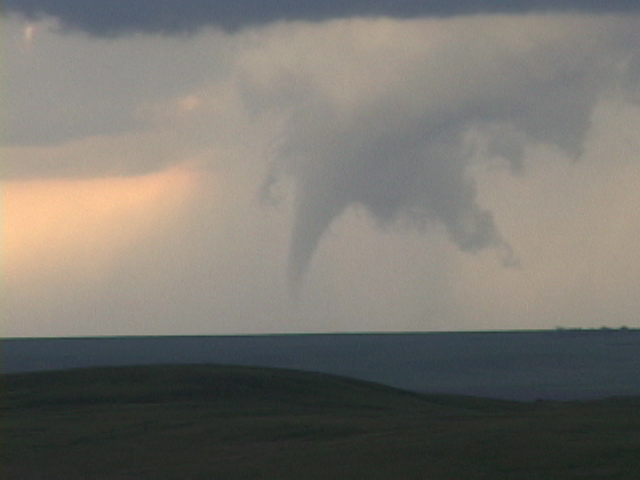 As we drove from Torrington to near Scotts Bluff, we first noticed a high-based funnel on a small cumulus. 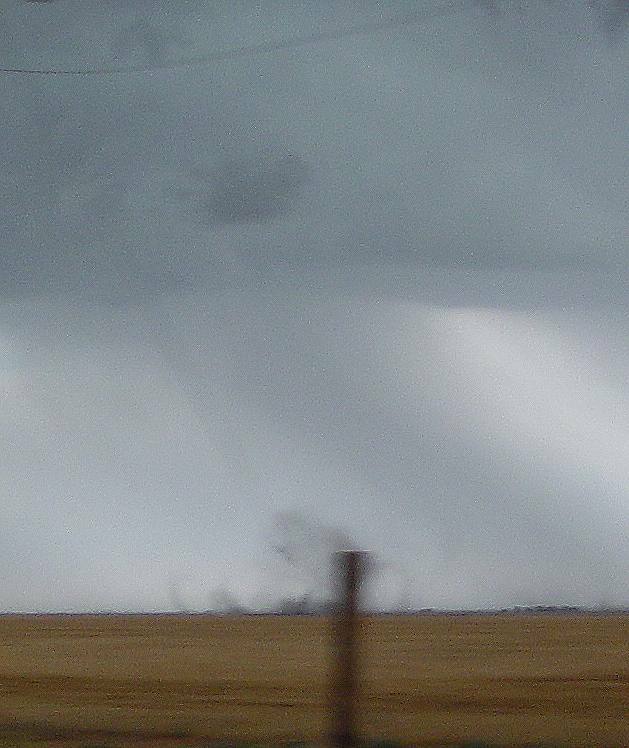 Then, many rain and hail shafts from high bases were associated with microbursts in our area. We initially tracked a strong storm north towards Chadron that briefly had some sort of a rain-free based....but we realized that it was probably a left-moving split, flying northward at supersonic speed towards South Dakota, and the cold stable air north of the boundary, so....we gave up and headed to Scotts Bluff for the evening. This was to be the first of three in which we played tag with a southeastward moving cold front. 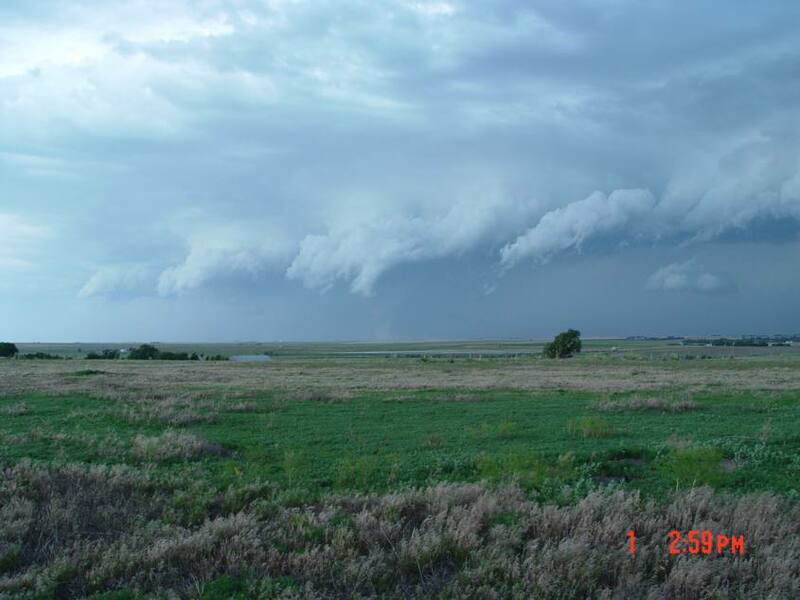 By evening, this front was in the northern Nebraska Panhandle. An incoming disturbance in the mid and upper troposphere was to have lowered surface pressure in se Colorado by afternoon, creating an upslope flow of easterly or southeasterly flow into the region. The visible satellite image at 1732 UTC showed enough clearing through the cirrus into the area for diurnal destablization. The cold front previously in Nebraska, would continue sagging southeastward, to the Nebraska-Colorado border by evening. Our plan was to play the upslope flow just south of this front. By afternoon, the surface pattern did develop more or less as forecast. Trajectories from sw Nebraska extended into northeast CO, bringing near 60 degree dew points into the area. However, the surface wind field was chaotic in eastern CO and western KS, as opposed to the general southeast flow expected. Multicell storms developed along and just ahead of the cold front. 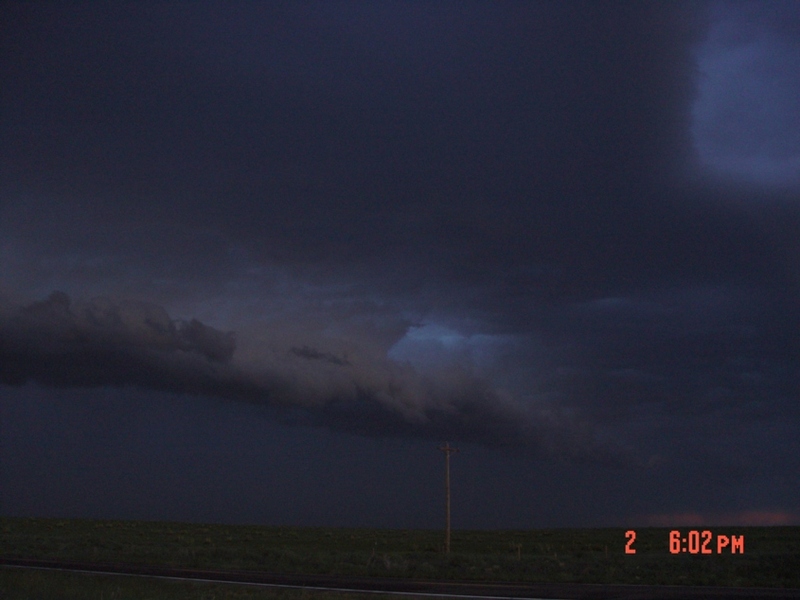 These formed a continuous line by late afternoon, stretching from Ogallala to Cheynne, WY. Meanwhile, only a few scattered strong to severe storms developed in the warm air ahead of the front. By mid afternoon, SPC issued a Severe Thunderstorm Watch for our area. Storms finally developed, but far west, just east of Interstate 25. One storm looked good enough for colleague Steve Hodanish to go looking at it. Although the storm briefly had a back-sheared anvil, and had a good looking rain-free base, the storm weakened by late afternoon. Since we expected the cold front to continue surging southward for the next two days, we agreed that the threat for supercells would be in south-central Oklahoma the next day. So we drove from northeast Colorado to Hays, Kansas for our overnight, in preparation for our southward drop into Oklahoma on May 19. We awoke to a raging north wind, gusting to 40 mph in Hays, in California-winter-like conditions, intermittent rain, nimbostratus, and temperatures in the low 60s. The cold front had surged through on our heels overnight. The RUC 12-h forecast showed that high dewpoints and moderate shear (~35 knots from sfc to 500 mb) would exist south of the front in extreme south-central OK and north-central TX by late afternoon. We drove through heavy squalls associated with clusters of multicells that developed along the front in south-central KS (see outflow boundary on 1400 UTC surface analysis). We finally passed through the frontal boundary just north of Oklahoma City, with temperatures rising in to the low 80s and dewpoints from the upper 50s and lower 60s to the upper 60s. 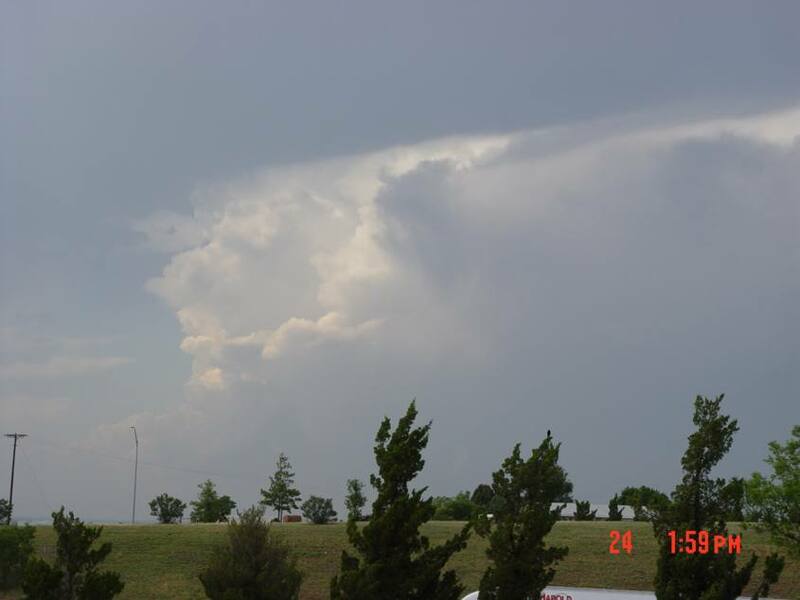 At around 4:30PM, explosive development occurred east of Lawton (~70 miles southwest of OKC). This occurred in an enviornment (correctly forecast by RUC) of high CAPE (~3000 J/kg) and moderate shear (~40 knots from sfc to 500 mb as short wave evident on forecast spread over the region). Hodographs were straight, so mirror-image splitting storms were expected. About 35 miles west of Pauls Valley, OK, and near Duncan, the initial thunderstorm split. We watched the left mover for a while as it raced northward, and then dropped southward to the right moving storm, itself propagating southeast at 15 knots. 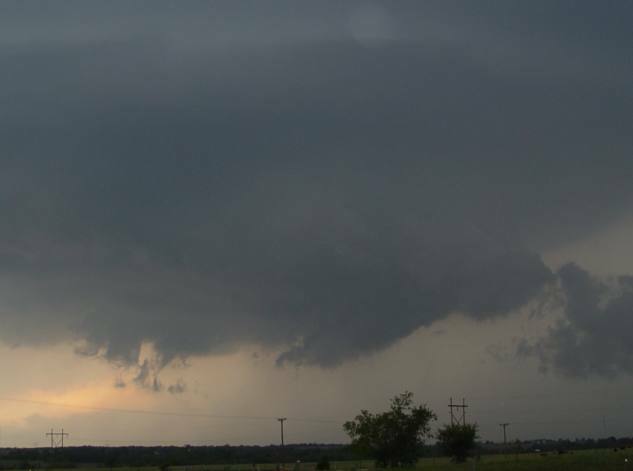 This storm had nice structure, a striated bowl shaped base, mid-level stingers, an inflow (beaver) tail and, eventually, a weak Rear Flank Downdraft. In fact, a Tornado Warning was issued for the storm. However, the storm was largelly undercut by outflow. 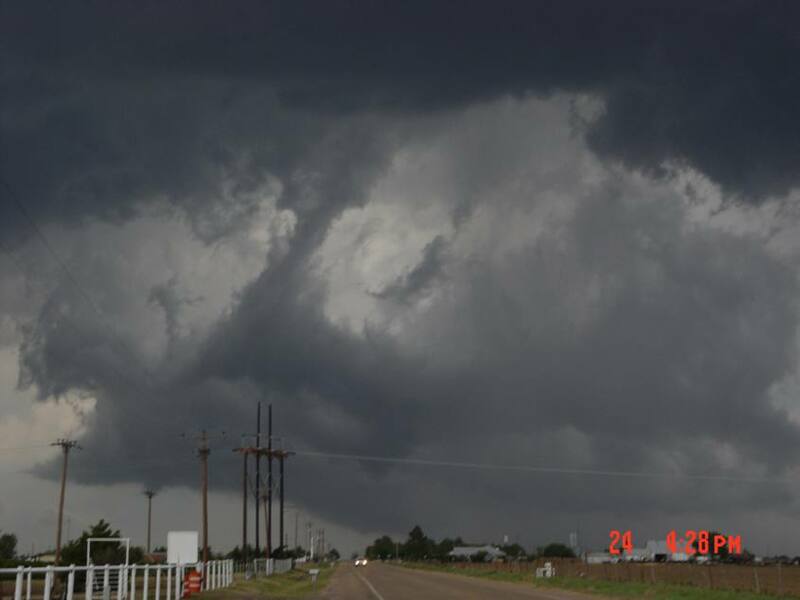 We did not see a tornado, although there were several funnel clouds and a moderately rotating wall cloud. We spent the evening in same Ardmore, OK Holiday Inn in which the escaping members of the Texas legislature's redistricting vote spent last week! (By the way, chasers interested in finding places in which to stay in Ardomore should consider the Hilton...the rates were the same as the Comfort Inn). We were treated to an awesome, violent thunderstorm that raged for about an hour around 11PM....with multiple cloud-to-ground strikes so close to the motel that we felt we were under attack....marble sized hail, and winds int eh 50-60 mph gust range. We felt that the next day would be a down day. At least marginal shear and buoyancy would return to the south TX panhandle by May 21..but tomorrow would be "washed out" by the cold front crashing southward all the way to the Gulf of Mexico. This was a day of getting back to the West. The pattern is to be a marginal one...with mediocre shear. But we have seen such patterns produce supercells before, often when short waves unforseen by the models, sneak under what many feel is a "death ridge". We woke up to incessant rain and strong north winds in Ardmore, as the cold front plunged all the way south to the Gulf Coast. We drove north from Ardmore to get to Interstate 40 for our westbound leg to Amarillo. While doing so, we stopped in Moore and took some pictures the powerfully illustrate the damage from last week's F4 tornado that went through Moore. 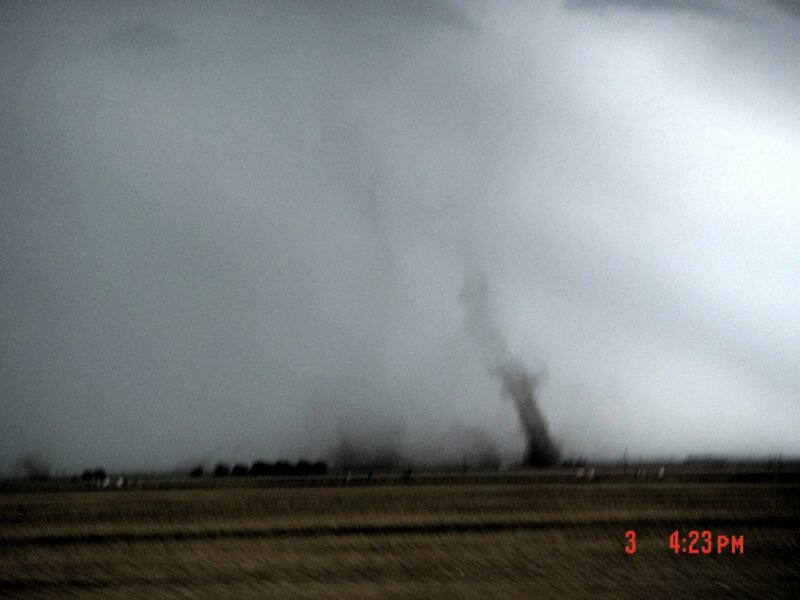 These pictures underscore the need for the public to take cover when warnings are issued. The pictures showfelt that the next day would be a down day. At least marginal shear and buoyancy would return to the south TX panhandle by May 21..but tomorrow would be "washed out" by the cold front crashing southward all the way to the Gulf of Mexico. Here are pictures of what is left of a Motel 6, a Comfort Inn, a debris container facility, an apartment complex, a power pole snapped at the base, and other damage to roofs and other structures. We are spending the night in Amarillo. Cold Front Continues To Mess Things Up! We awoke to find the progs suggesting that the better pattern would be developing to our north, perhaps in eastern Colorado, and even then, not until the next day. The reason for this was that the southward movement of the cold front through Texas had stalled, and the north winds behind it that were preventing the return of moisture still persisted. So, even though southeast winds had returned to the area from eastern Colorado south to the Texas Panhandle, they carried only low dew points. The Amarillo sounding showed that the surface layer was still the shallow under-cold-front boundary layer, with low dew points. Note that the sounding above around 800 mb looked pretty good. The other problem was the very weak northwesterly flow in the mid and upper troposphere. But it was clear that this was to be a down day...so we repositioned to southern Colorado, spending the night in Trinidad. We had high hopes for the next two days, as moisture continued to return into northwest KS and eastern Colorado. However, even though near-60F dew point temperatures did return....they did so under the very high 500 mb heights of the ridge that was currently over the Plains. Thus, CAPEs were still low and convection struggled. Here is a picture of a struggling tower, and of a distant storm, both in Kansas. The frustrating thing was that the directional shear was excellent, although the speed shear was barely marginal for storm-scale rotation. But it was somewhat favorable, and it was clear that updrafts were rotating, as is shown by this illustration of the same struggling storm. 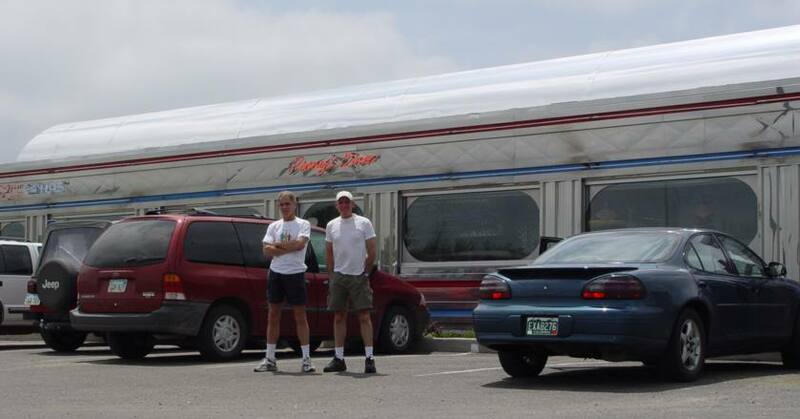 We were rewarded with a great lunch at Penny's Diner in extreme west Kansas, and an unusual anticyclonic LP supercell. This storm was weakening fast as we got to it near Boise City, Oklahoma (in the Panhandle, just over the Colorado border). But the anticyclonic striations were very prominent. And we were rewarded with the site of the storm eating itself up, as the updraft drew up into the midlevel of the storms and disappeared, leaving a bizarre cloud structure. We awoke to find a somewhat unexpected pattern. We had thought that southeast winds would still be occuring in the Panhandle, and that the Panhandle would still be ahead (south of) the next cold front. Well, the Panhandle was south of the cold front, but some other boundary was south of that. 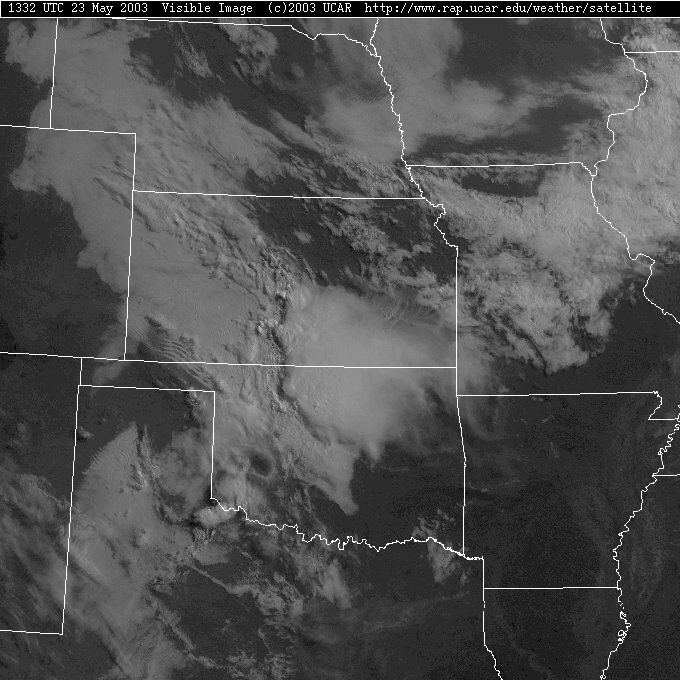 In addition, an outflow boundary from an MCS in Oklahoma was moving westward. 60F+ dew points were south of the boundary and west of the outflow boundary. 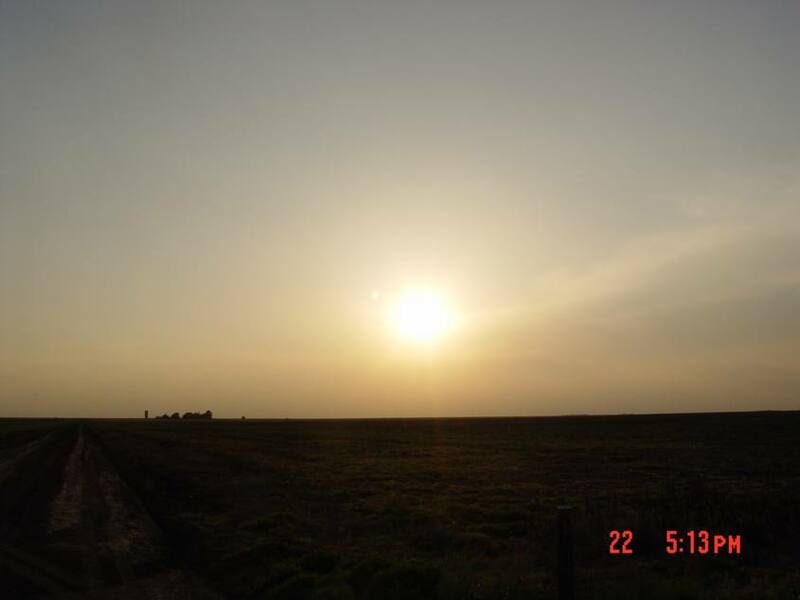 We initially targeted the Childress area, but as we drove southward, and passed through the boundary, we noted that it was a focus for small cumulus development. 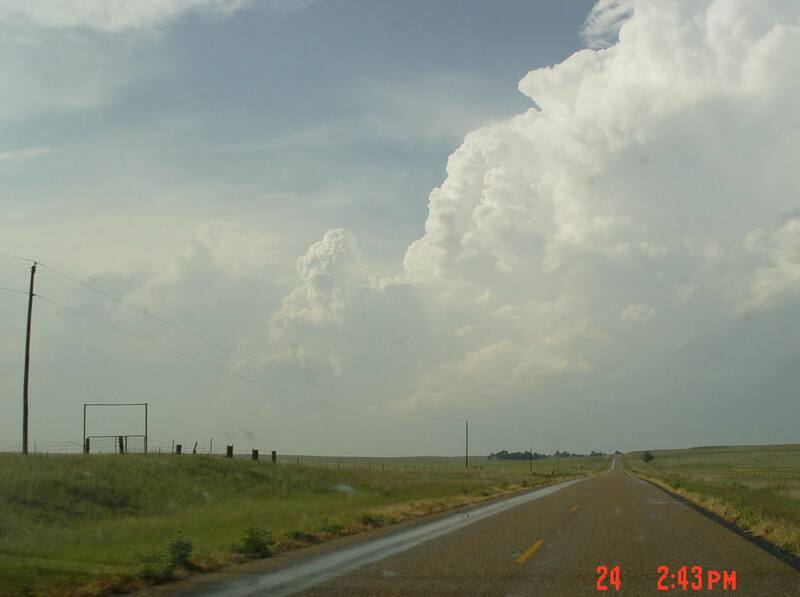 By the time we reached Clarendon, two small cumulonimbi had developed to the north of us on that boundary, and colleague Matt Crowther, who was 30 miles north of us, reported that convection was "crisp" (meaning penetrative and dominating the enviroment with towers without fuzzy edges) was ongoing on the eastern portion of the boundary. 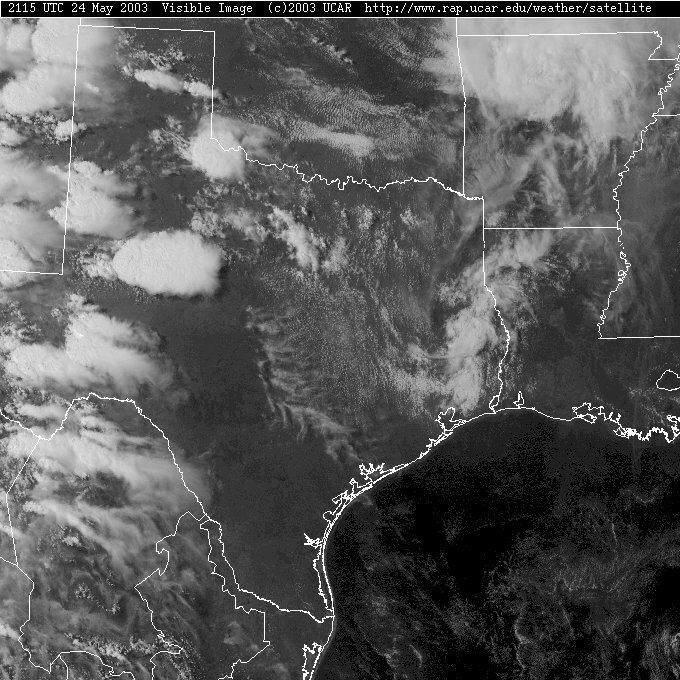 In retrospect, the westward moving outflow boundary had created a focus in central Roberts County. Afternoon forecasts suggested that the boundary would remain there, and that surface winds and dew points would be favorable for convection. However, wind shear was the issue...with rather mediocre 500 and 300 mb flow forecast. The forecast CAPE field suggested severe storms anywhere in the TX Panhandle and the south Plains. However, the shear forecasts were definitely ambiguous. Certainly, the directional shear was favorable for right moving supercells. However, the deep layer shear was not unless the surface winds were to be southeasterly and over 15 knots. If that occurred, the weak northwest winds of 25-30 knots would yield supercellular shear. As it turned out, the shear profiles cooperated. And, the curved hodograph in a northwesterly wind in the mid-troposphere yielded exactly what would be expected: a west-southwest propagating supercell. And what a supercell it was! As we looked north from Shamrock, we noticed the southern-most storm. But, we anticipated that if any storm was a supercell that it would have to move west-southwest, and that its action area (wall cloud and rotating updraft) would be on the northwest flank in this "untraditional" shear environment. So we drove west before driving north. And doing this allowed us to see the storms further north, as the storm initially visible died. 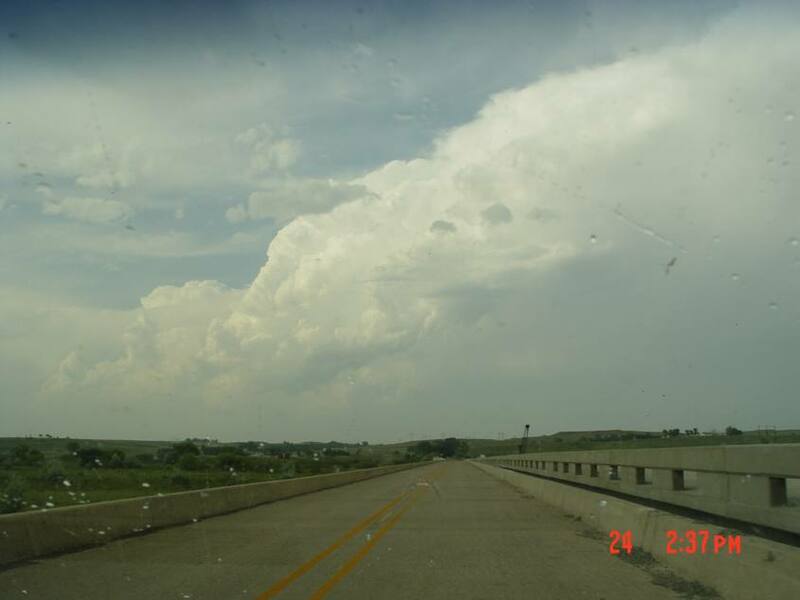 As we drove north, we noticed that the northern storm had multicellular appearance, but that crisp convection continued. And, eventually, all this convection coalesced into one updraft. We had a supercell!! As we approached Miami we could see a circular base, rain curtains wrapping counterclockwise around the updraft. We actually drove underneath that, and could see what appeared to be an rear-flank-downdraft (RFD) notch and the cyclonic striations on the lowered base. Fortunately, the road we were on meandered west-southwest-ward, so we could stay on the west side of the updraft. 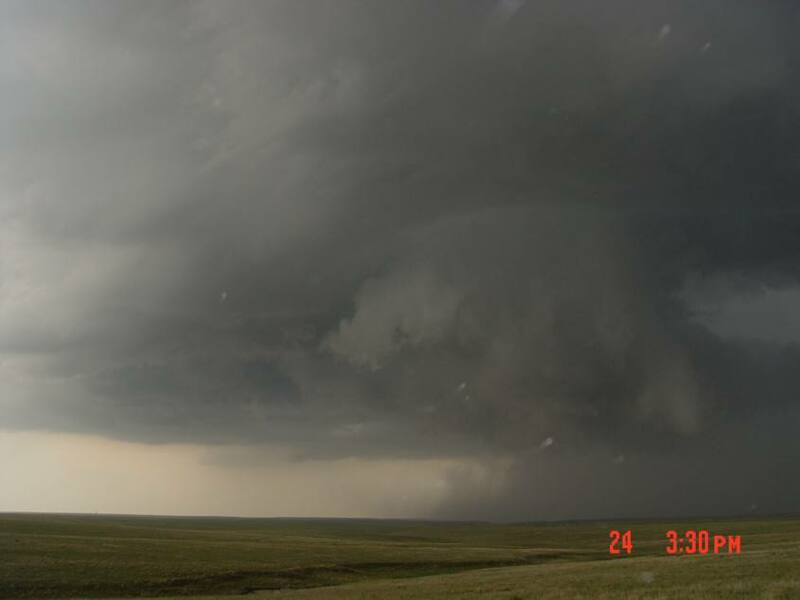 Around 6:30PM CDT, the base began to assume much better structure, with a bell-shaped lowering, beaver tail, and wrapping rain curtains around the north ane west sides. As we drove ahead of this impressive structure, first one weak tornado developed (6:49PM CDT) to our east and then, shortly after that, a second weak tornado spun up. 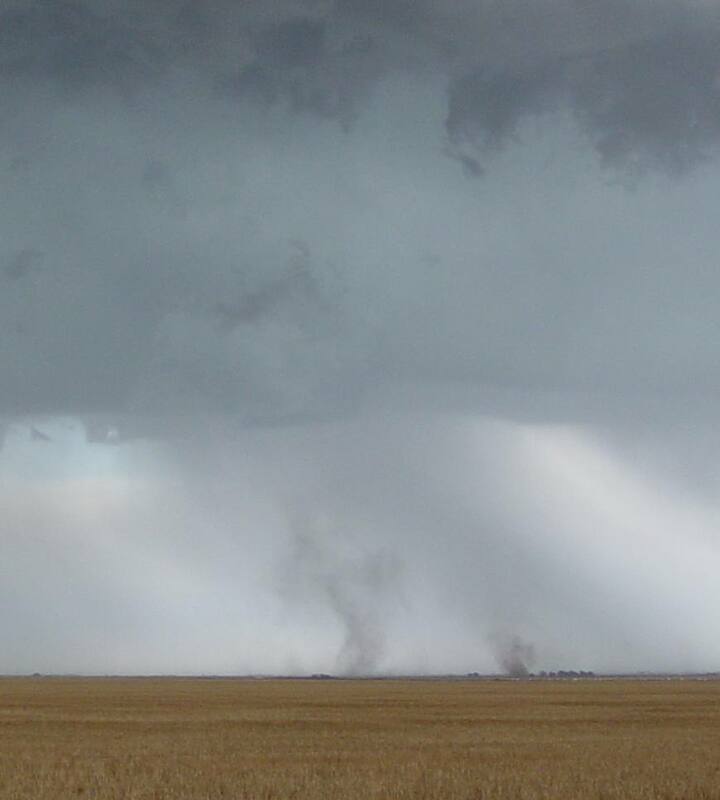 These were very brief, but definitely tornadoes...and so we did report this via our colleague Chuck Doswell to the Amarillo NWS office...and a Tornado Warning was issued. See SPC's rough log and US severe weather map to see the manner in which our tornadoes appeared in the reports. 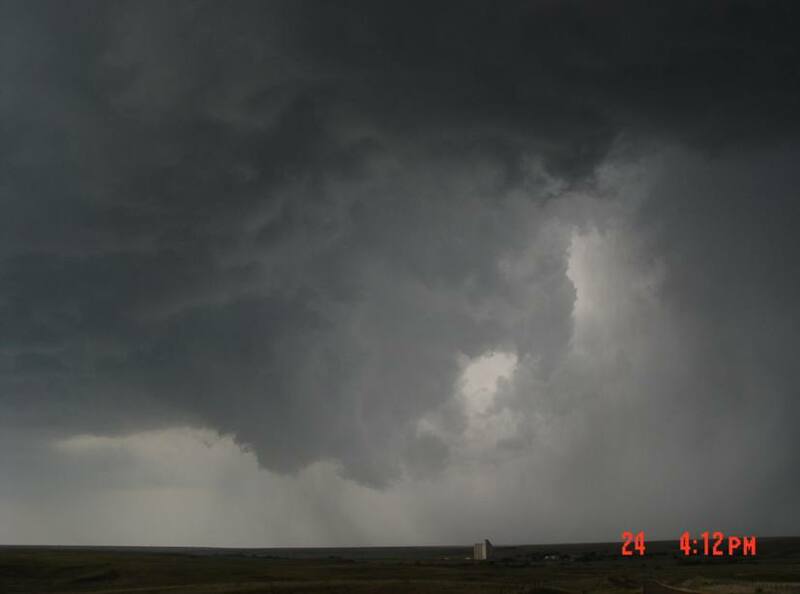 The tornadoes quickly dissipated, but the storm structure was still great. Looking east, take a look at the lowered base and the beaver tail. Then as the storm approached Pampa it developed another RFD, and finally a tremendous outflow feature with all sorts of horizontal vorticity evident on it. All in all, this was a tremendous storm. We had a great chase, had tremendous storm structure, made the right decisions because we understood the hodograph, and were rewarded not only with a great storm, but also a couple of tornadoes. We spent the night in Plainview, TX (40 miles north of Lubbock), after braving an MCS thrashing TX on the 110 mile drive to sleep! After leaving Thom off at the Lubbock Airport, I joined Chuck and Vickie Doswell for a tandem chase into the region west of Midland. There, moist air feeding upslope seemed to be focused by a boundary that lay west to east into the region near Hobbs NM. 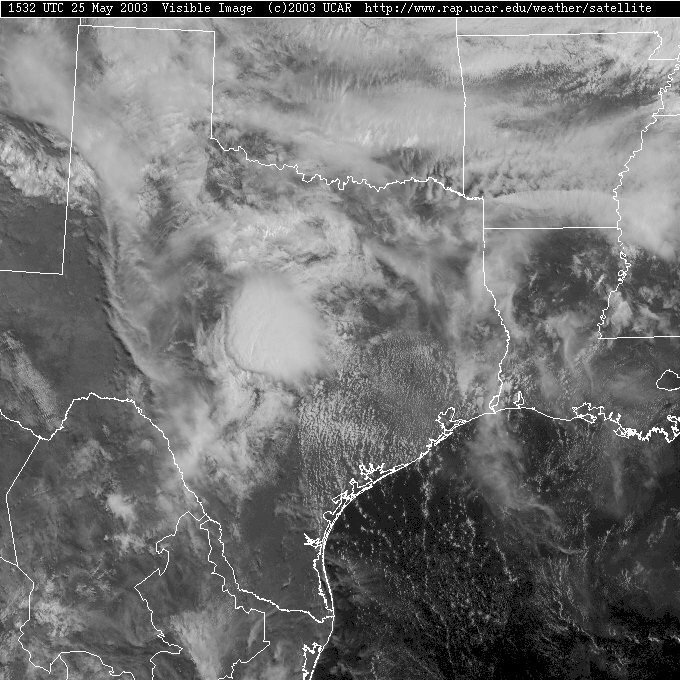 A short wave emerging from the Southwest MIGHT produce enough shear to be conducive for supercells in west Texas. However, what happened was that initially isolated storms seemed to struggle against the cap, or against synoptic scale subsidence. 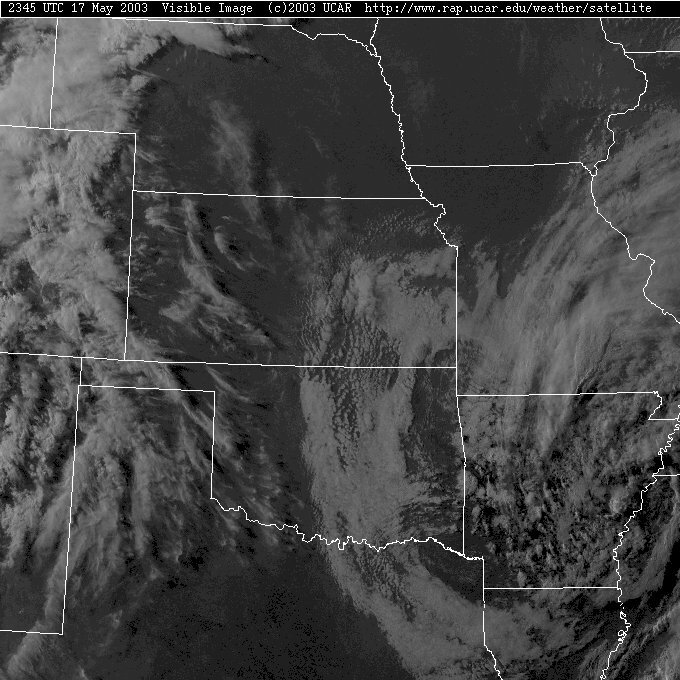 Eventually storms erupted in many locations, finally forming an impressive bow echo MCS. 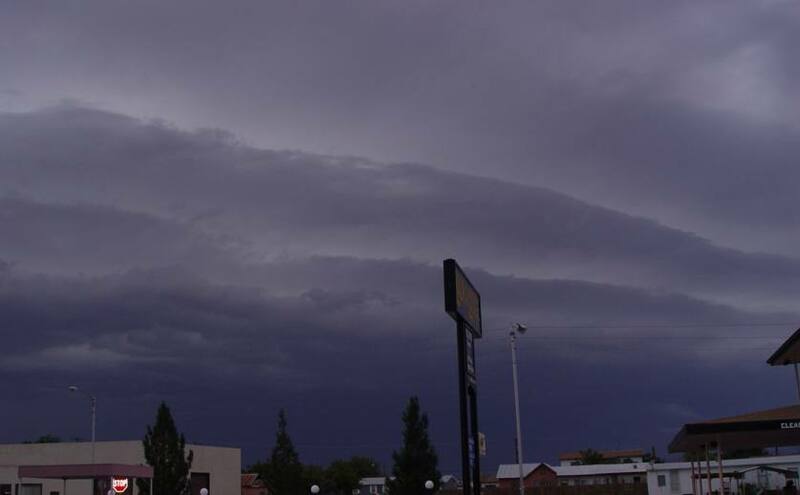 This passed through Pecos around 1030PM CDT...and as it approached, a spectacular "mother ship" outflow shelf was visible. Curiously, lots of lightning but no rain fell in this very dry area of Texas, yet as the system plowed into moister air further east, over 2 inches of rain fell in Midland. We spent the night in Pecos TX. Is The Pattern Dead? Moving Back North for Possible Early Exit! 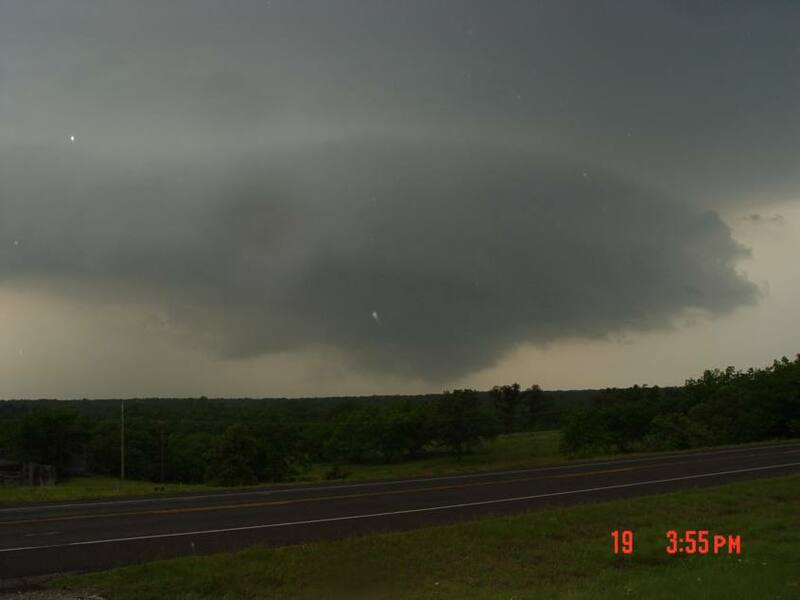 This day was a loss as far as severe weather goes. Chuck and Vickie exited for a visit with friends in the Davis Mountains, and I began drifting north for a possible early exit from the chase should the models suggest that there was no hope. On my way to Las Vegas NM and an overnight, I stopped at Carlsbad Caverns to try out the low light features of my new digital camera. The results were spectacular...and if I had had a tripod with me in the wonderful 3 mile underworld jaunt, they would have been perfect. See the brooding giants, the dollhouse, the puppet theater, Chinese warriors, and other miscellaneous and marvelous scenes. After hooking up with Matt and Betsy Crowther at the Super 8 in Boulder on May 27, I decided to hang out in this wonderful, beautiful town. I still have not made a decision about early departure because there is some hope for the pattern to redevelop as favorable towards the weekend. In the meantime, why not relax a bit? The running is wonderful, and it is a relaxing place to stay. I visited the Pearl Street Mall, of course. 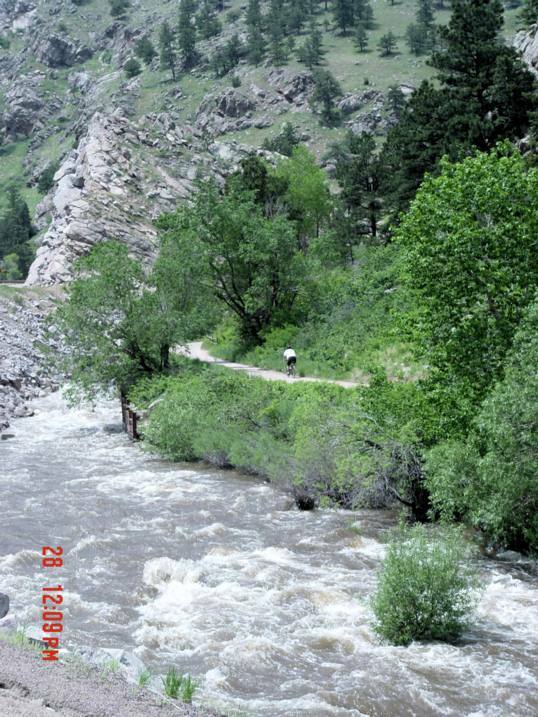 But most of all, running along the Boulder Creek Trail is a favorite of mine. 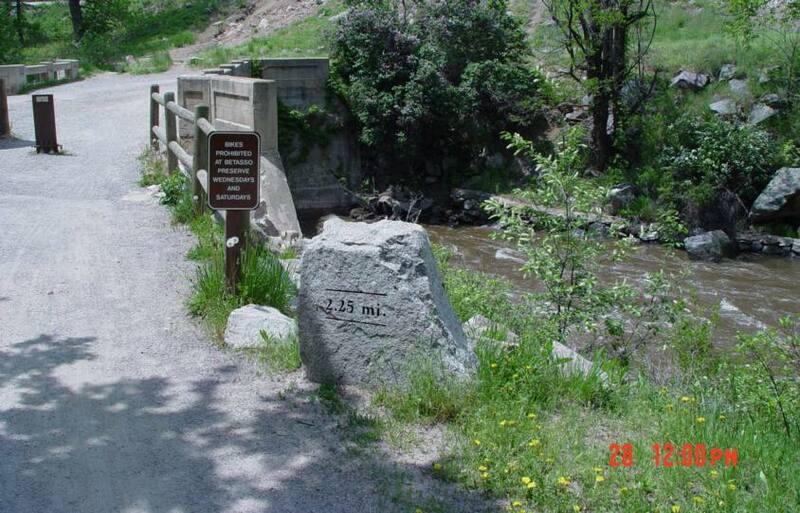 The trail winds through Boulder and then goes an additional two miles or so through the eastern portal of Boulder Canyon. The trail is well designed, with bridges and underpasses. All along the way, the rushing Boulder Creek is evident. 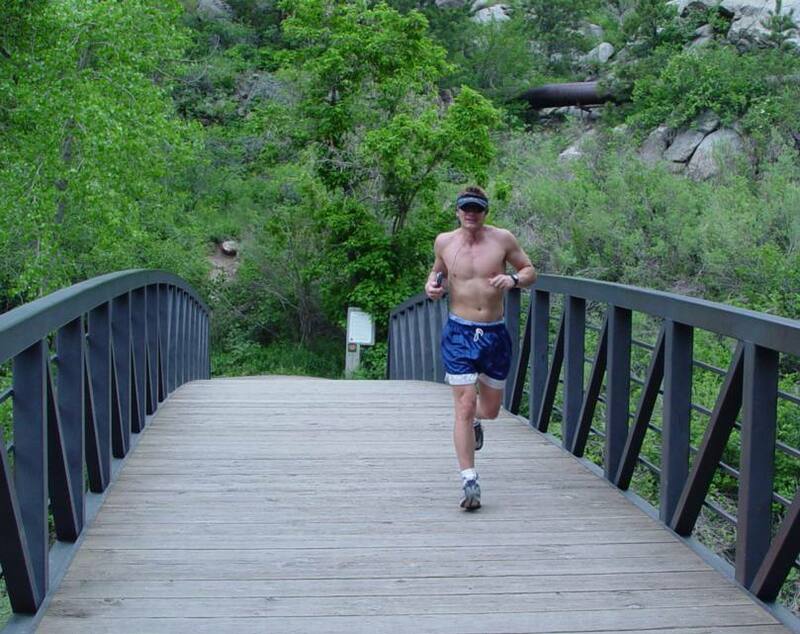 (Thanks to an anonymous friendly runner who allowed me to take his picture crossing the last bridge before the trail emerges into Boulder). Afternoon thunderstorms developed in the mountains on each day. 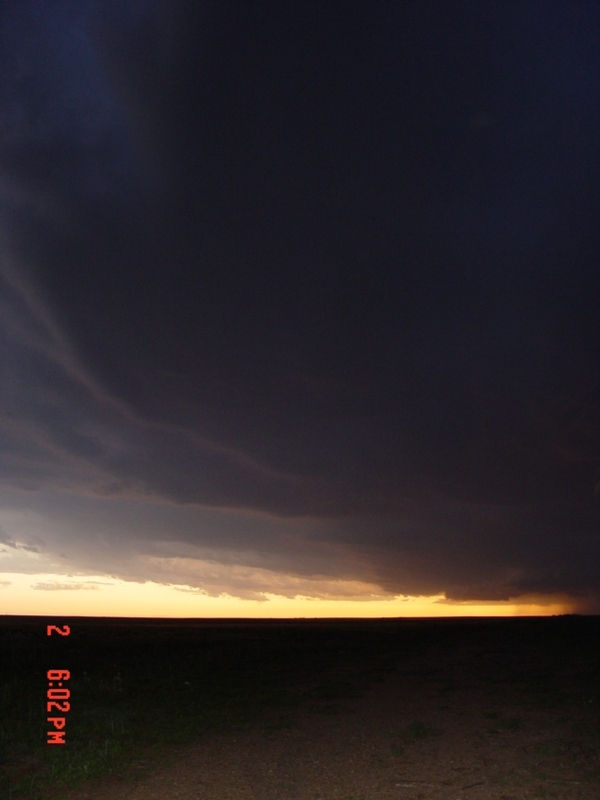 On May 28, a series of thunderstorms that developed north of Colorado Springs on the Palmer Divide sent an outflow boundary northward that initiated a new thunderstorm south of Denver. The radar loop shows the outflow boundary spreading northward and the new storm developing. On May 29, I visited I awoke to this view of the Flatiron Range of the Rockies. I also visited NCAR, located on Table Top Mesa. 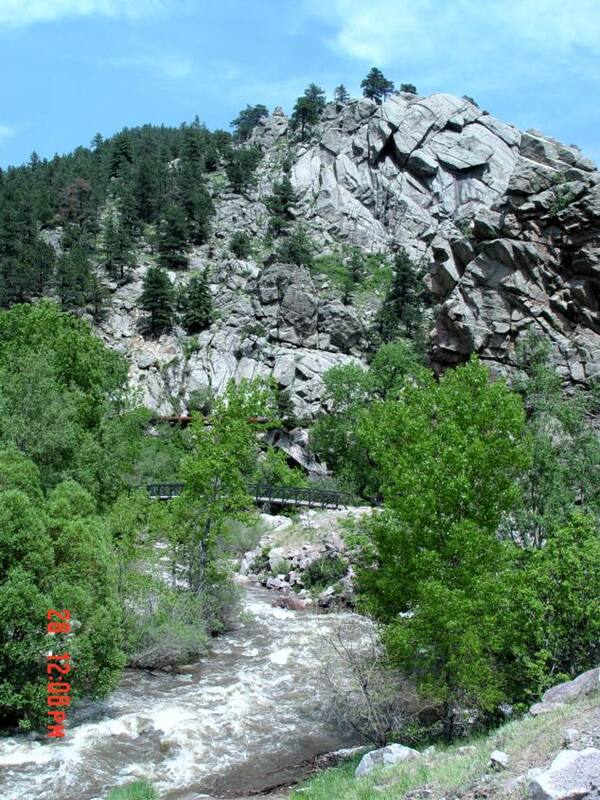 There is access to the famous Mesa Trail...a hilly foot trail that contours the Flatirons. There are beautiful views along it, although it is pretty rocky, many runners use this trail because of the spectacular surroundings. Also, at NCAR, I visited the Walter Orr Nature Trail...dedicated to the founder of NCAR.. Finally, the pattern began to change by May 30. Southeasterly flow returned to the area with moderate flow at 500 mb, with thunderstorms, including a couple of weak supercells, spreading into the area. We did a brief out and back chase....but the better pattern is expected tomorrow. 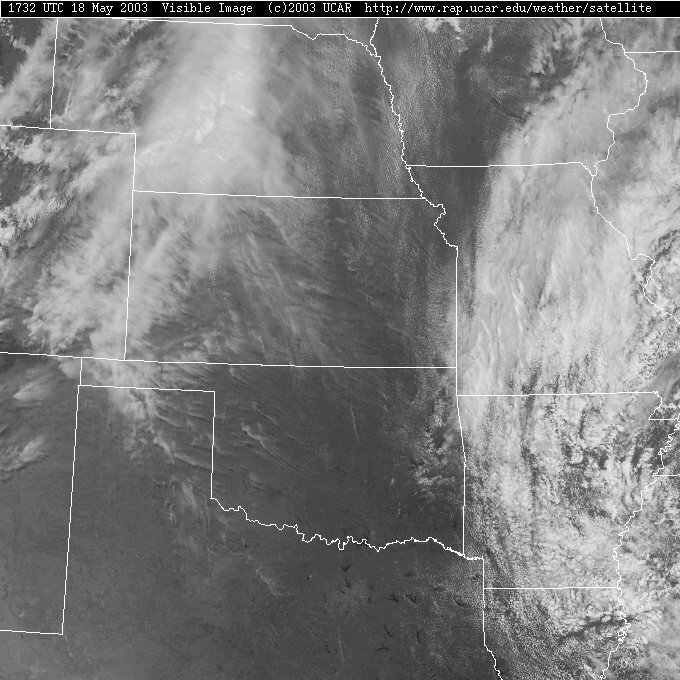 Later, a mesoscale convective system overspread most of eastern Colorado. Flow at 500 mb was expected to be in the 30-50 knot range over eastern Wyoming and western Nebraska. The surface pattern showed moderate amount of moisture streaming into the same region, with dew points in the middle and upper 50s. We targeted the Cheyenne Ridge area of eastern Wyoming...but, after taking a brief drive back in to Colorado to check out some dying storms...we abandoned our target area for new stout updrafts west of Scotts Bluff. By the time we got north, these storms died...and we heard a report of a much stronger storm northwest of Scotts Bluff. We drove north on Highway 71 and were rewarded with the sight of a distant wall cloud, with multiple fingers underhanging. 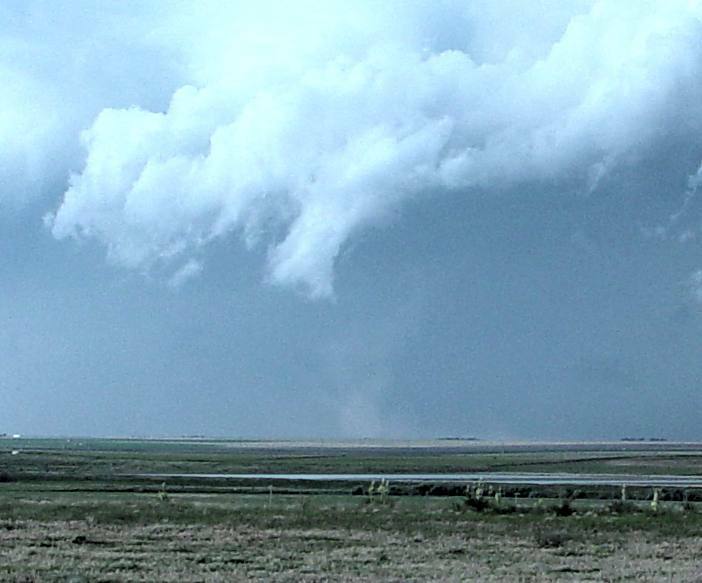 This was located about 15 miles northwest of us....and before I could get the cameras going, an elephant trunk tornado, very brief, appeared (taken by Matt Crowther, my chase partner for this leg of my trip). 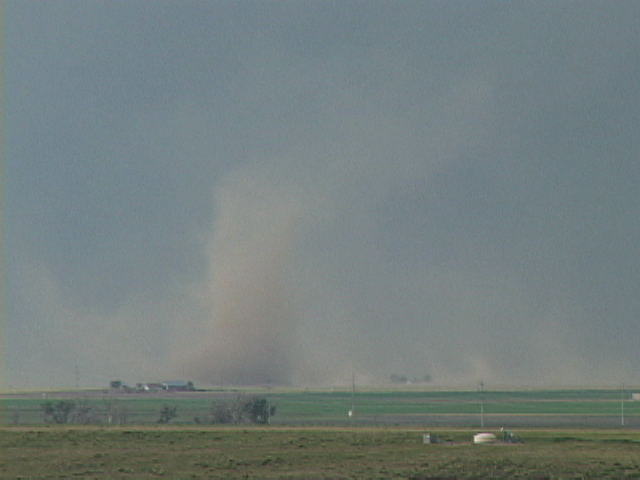 By the time I had gotten the camera out, the funnel had dissipated, leaving behind only a remnant. However, the parent storm's base soon became visible. 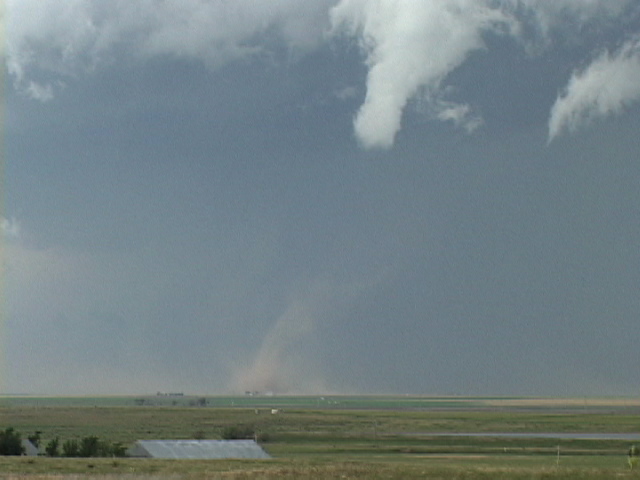 It was clearly striated, with a very strong updraft on its southwest flank. 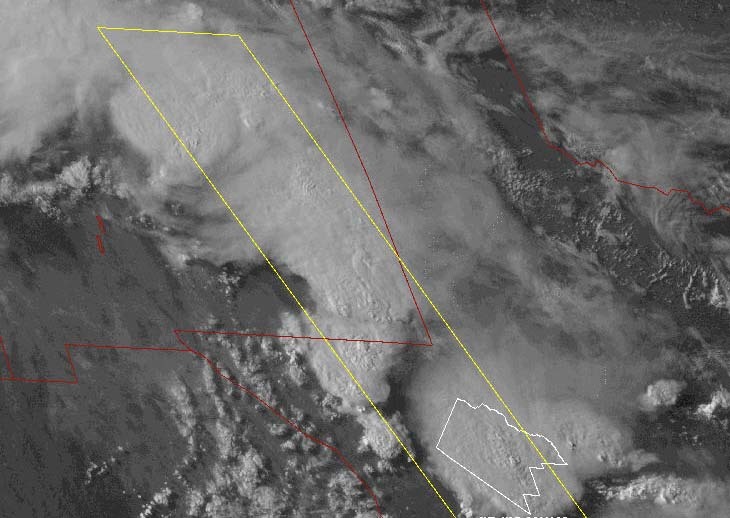 As it approached our area, we could see the broad RFD notch, with an anticyclonic cloud structure to the southwest, and the RFD cyclonic occlusion to the north. After this rewarding chase, we headed for an overnight at Sidney, Nebraska. 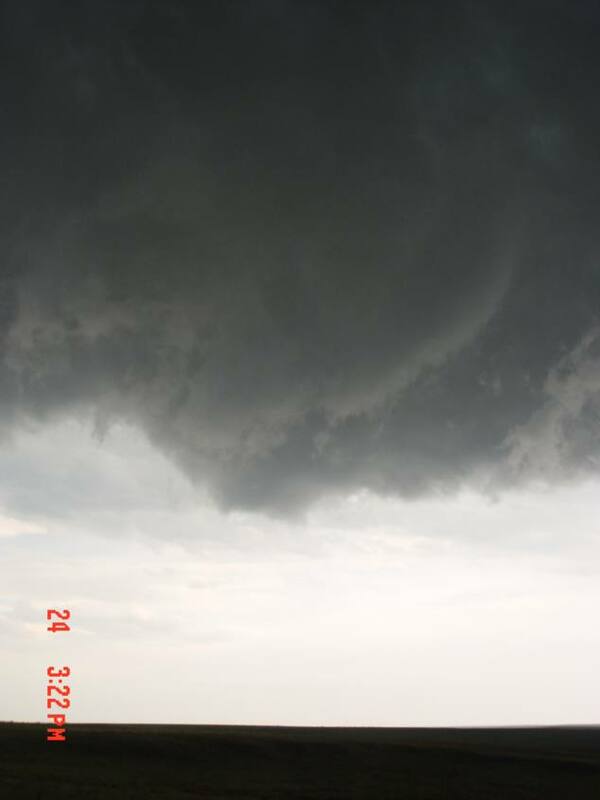 Squall-line with Large Gustnadoes Near Ulysses---One Pendant From Cloud Base: A non-supercell tornado? This was to be a rewarding day, even though we only saw embedded supercellular structures in a squall line. The day had promise because the mid and upper tropospheric winds finally were expected to be strong ahead of a short wave moving across the Rockies. Dew points were expected to approach 60 degrees in west-central KS north of a warm front. The structure of this large line with multiple bowed segments was stunning. 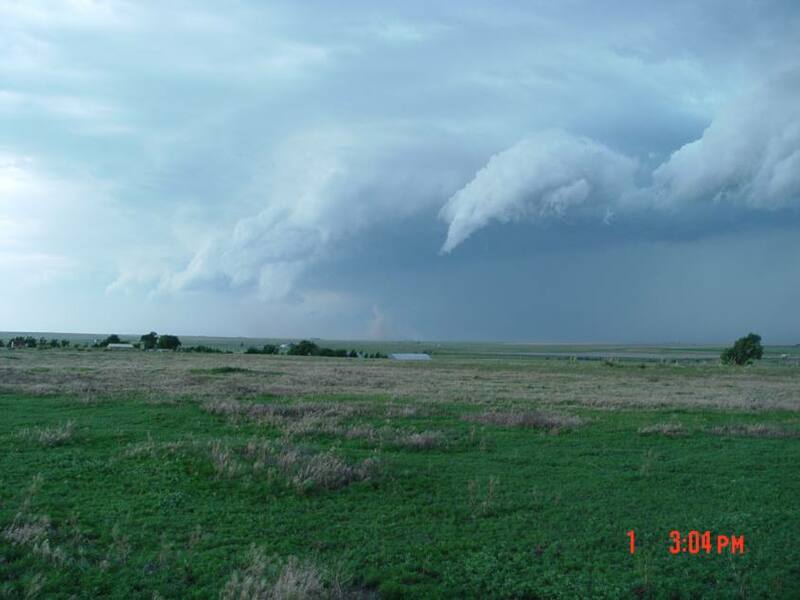 At one point, several large gustnadoes began to form, each under rotating fingers of shelf cloud. and this development was consistent in the region near Ulysses. One very large feature developed conically (photo by Matt Crowther), finally, connecting to cloud base including a quite strong looking cone that was quite broad, persistant and violent (M. Crowther). Later other large gustnadoes almost connected to cloud base. Without trying to stir up controversy, I take the position that the strongest of these (shown above) was actually a non-supercell tornado. Since the definition of a tornado is a violently rotating column of air pendant from the base of a cumulonimbus, this feature met that definition. An additional consideration, is that the shelf features above the gustnadoes were rotating markedly. 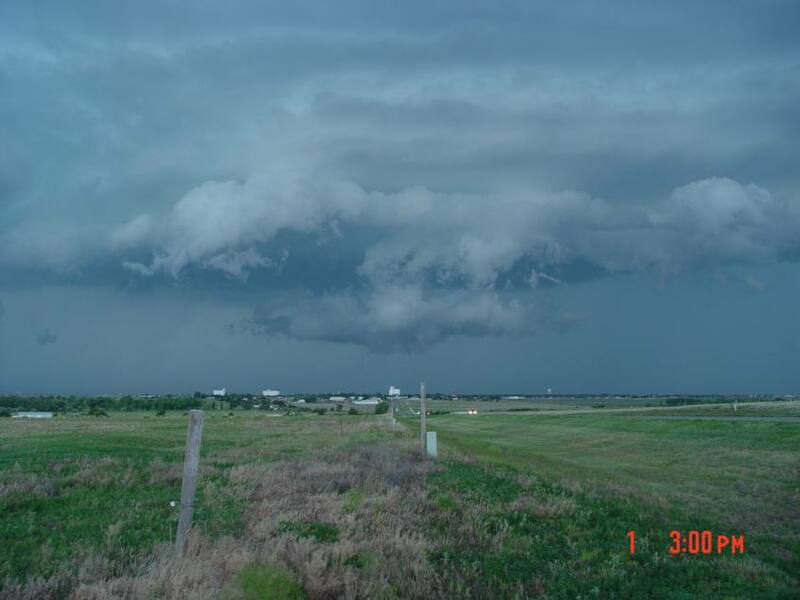 The line itself occasionally developed wall-cloud like features that rotated obviously and eventually became large shelf clouds. Later, we found out that buoyancy and shear never approached their forecast values. Yet we had experienced a very interesting storm. We spent the night in Liberal. We are stuck with the persistant northwest flow. However, on this day, the forecast surface pattern suggested upslope flow on the Palmer Divide and the Raton Mesa. Since the best deep layer shear overlaying a dew point tongue and a modicum of CAPE seemed aimed for the Palmer Divide, we opted for an intermediate stop at the Lamar Public Library. 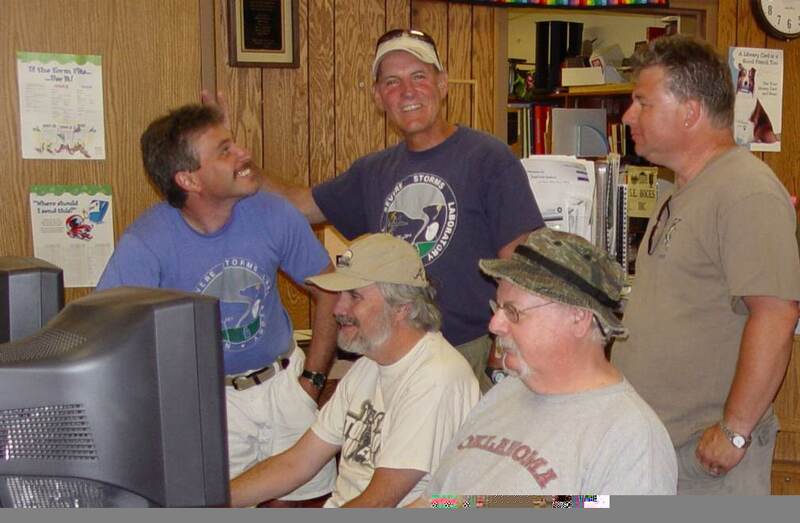 I rejoined Chuck and Vickie Doswell after an interesting and rewarding set of chase days with Matt and Betsy Crowther. 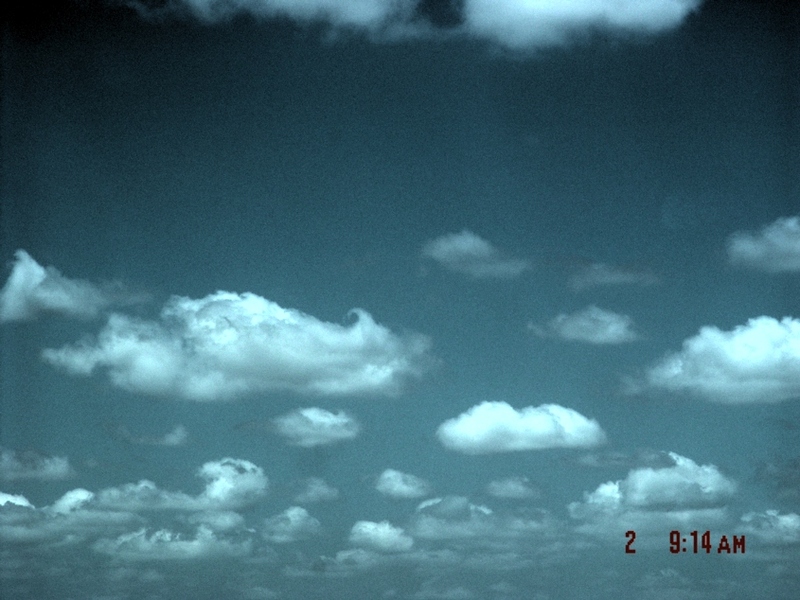 On the way northwest from Liberal, I passed througth a cumulus field. 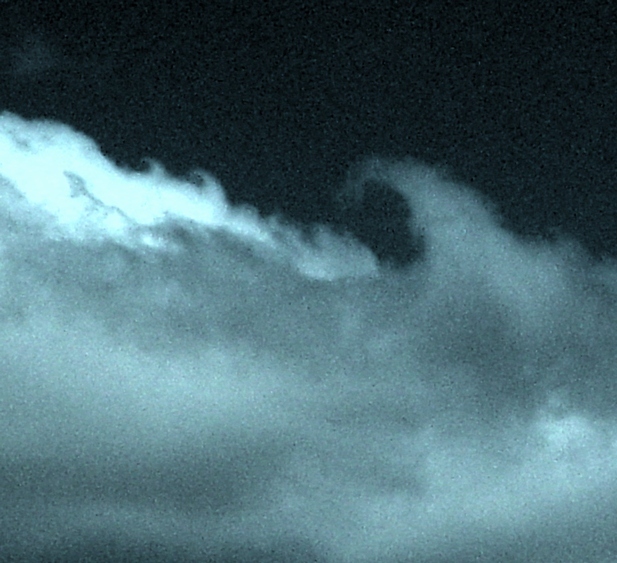 That these were devloping in an environment of strong northwest winds aloft was indicated by the sheared tops of the clouds, some of which formed horseshoe vortices. Our initial target showed no signs of development. 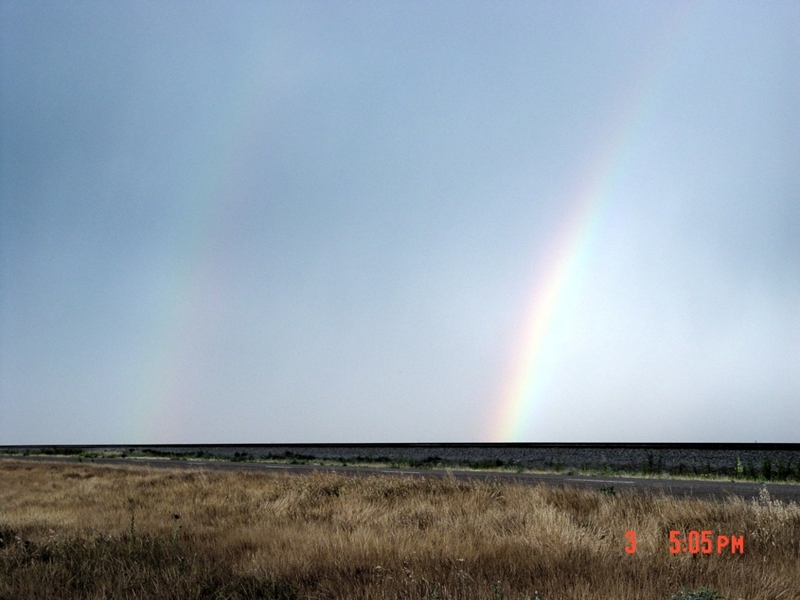 Since storms were developing south, on the Raton Mesa, we drove south towards Clayton, NM. 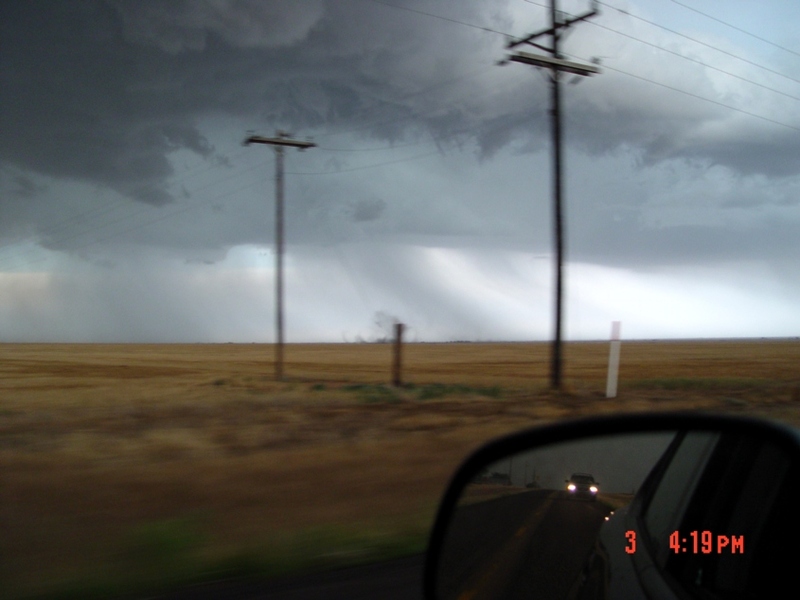 Along the way, we intercepted several non-tornadic supercells. The largest one pummelled Clayton with rain and small hail. On the west side of the storm, we saw a striated base. 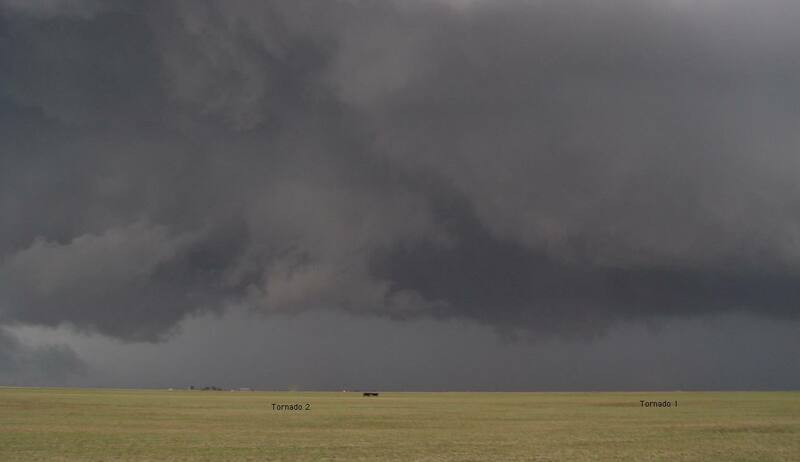 The actual lowering was outflow dominated and non-tornadic. We drove back to Clayton to spend the night. As we drove north, we passed under the roll cloud associated with the storm, for a spectacular sunset. We awoke to a day of great promise. Upslope flow into New Mexico was expected to bring in over 60 degree dew points into the area near Tucumcari. The forecast fields of deep layer shear, anvil level flow, and CAPE were favorable for tornadic supercells. And this was to be the only day of the trip on which an actual Tornado Watch was issued. At the surface, an outflow boundary from convection in Oklahoma was spreading towards the western TX Panhandle to provide a focus for convection. We drove south to the Tucumcari Libary after conferring with Greg Thompson and Jason Namchatkin. 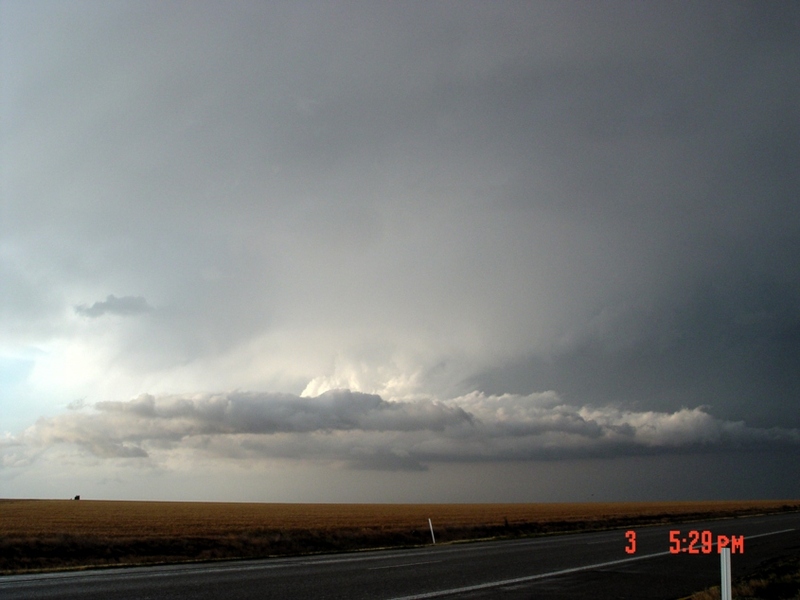 As we repositioned along the boundary, south of Interstate 40 in the TX Panhandle, a storm south of Lubbock beckoned. However, we noticed an explosive development north of Bovina. This storm immediately split, and we positioned ourselves on the right split. This storm had a base, but not a lowering. It also had a flank that extended southward towards Friona. 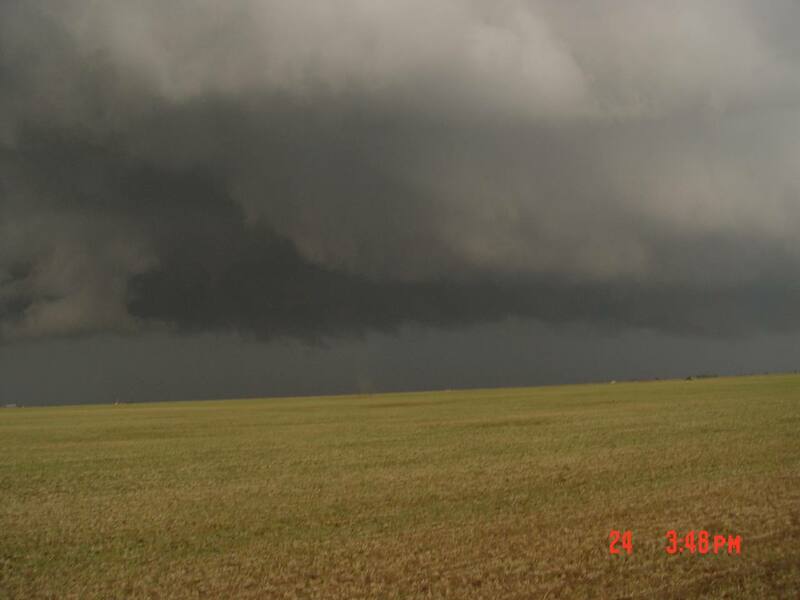 When large hail forced us to move south on this flank, we noticed rapid rotation developing on this base. 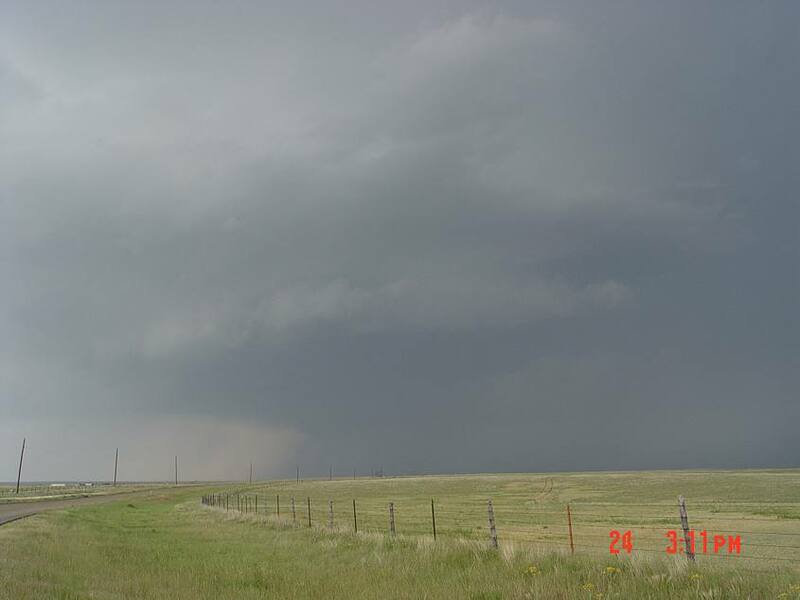 Underneath this, dust whirls (picture shot by Vickie Doswell...showing me slamming on brakes) developed into the first tornado, at 0014 UTC. The first tube weakened quickly. It was replaced by another whirl, ab out 1/3 mile south. 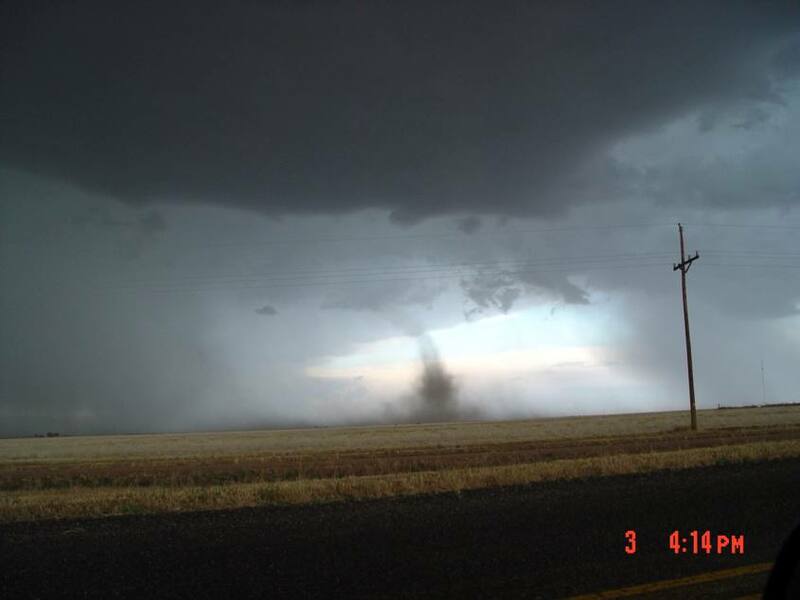 This developed into a dust cone tornado to cloud base, connected to the rotating portion of the cloud base. 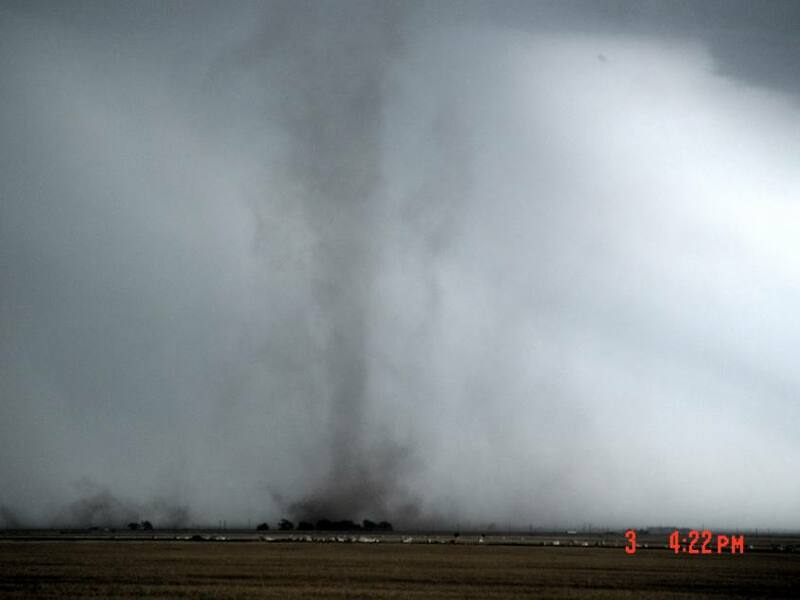 This tornado lasted about two minutes. 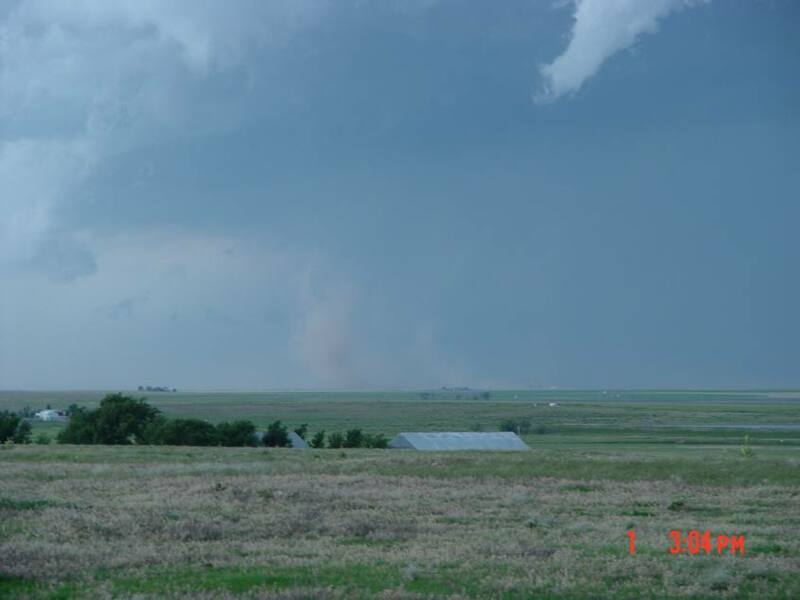 South of the location of the dissipating tornado, a new tornado developed. 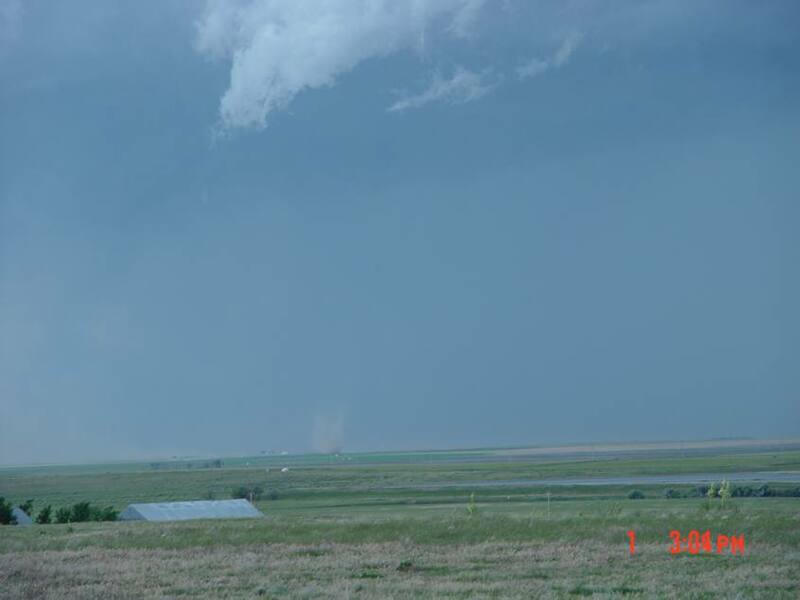 This developed into a mutliple vortex tornado, which dissipated to be replaced by a fourth tornado. 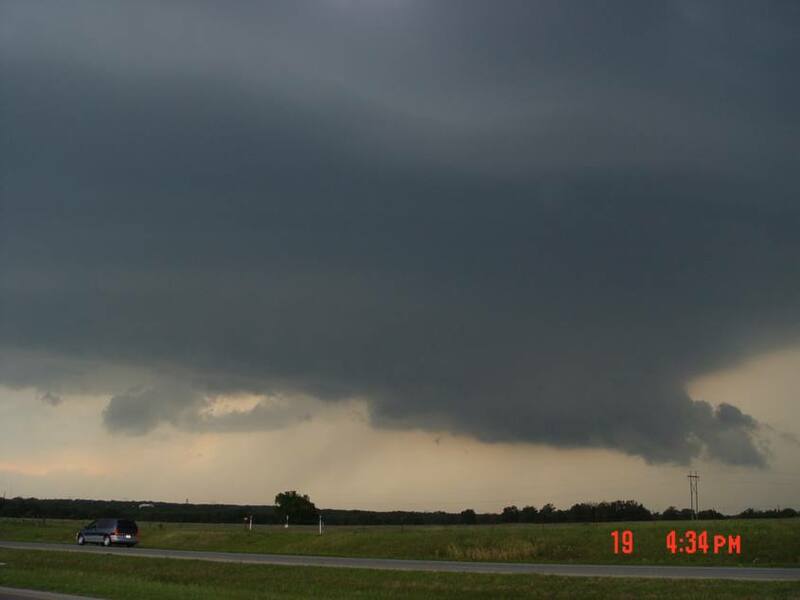 During this 15 minute period, the radar development showed that the updraft flank had become a supercell. 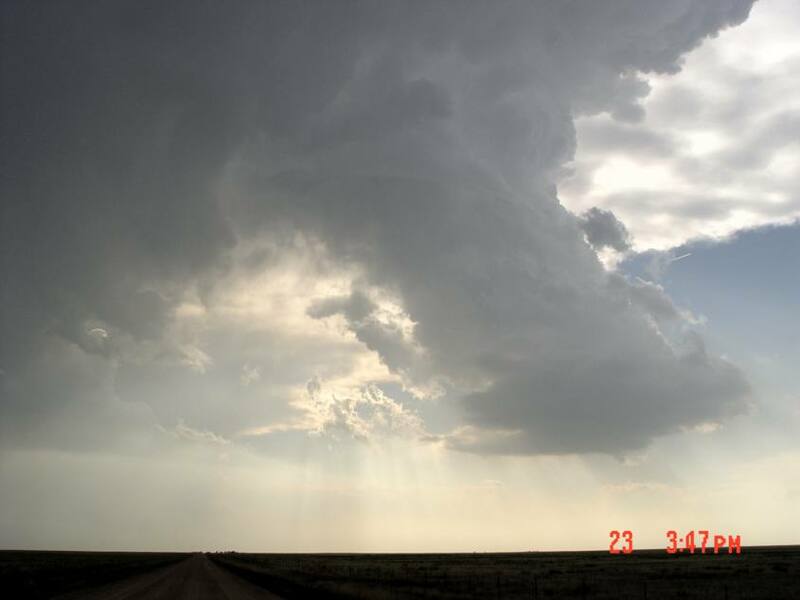 A separate cell moving eastward from New Mexico passed into the path of our storm...which intercepted the rain cooled air...this suppressed its updraft and the two storms merged to form the hail producing storm that caused damage in Muleshoe, TX. The entire radar development can be seen here. 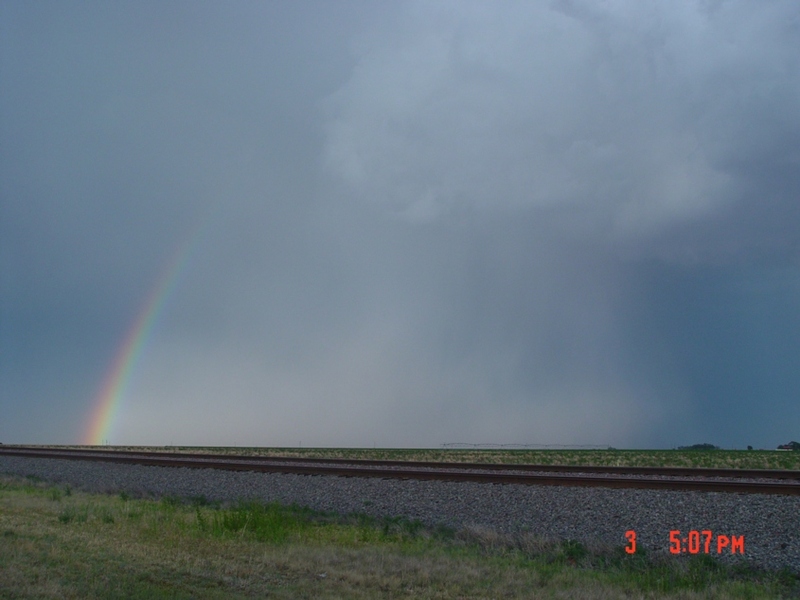 As we let the storm leave us to the south, we were rewarded with a beautiful double rainbow, and the site of a rainbow next to a major hail shaft. Further north, yet another supercell moved towards us, but it was ingesting the rain cooled air left behind by our storm, and died quickly. 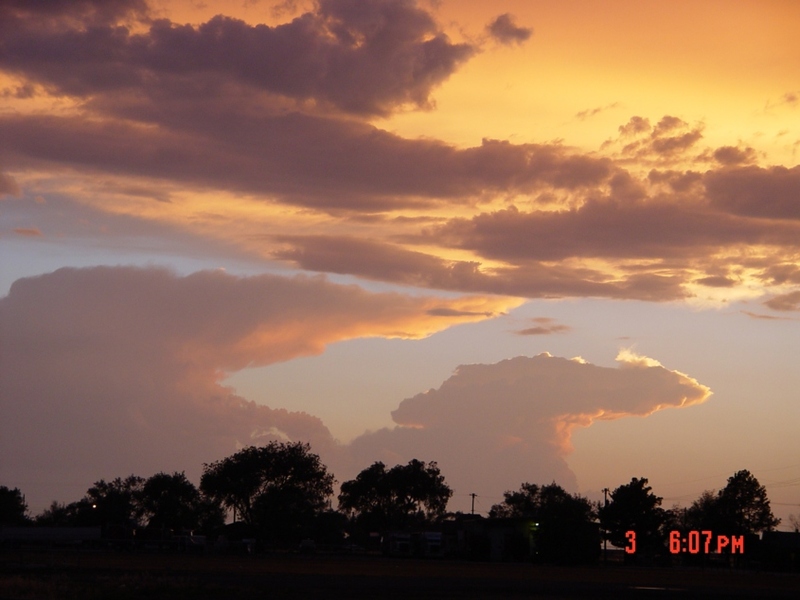 As the sun set on this rewarding day, a stunning view of distant anvils provided apt punctuation as I left Chuck and Vickie to get to my overnight in Raton NM. This was to be my last day in the Plains this year. In retrospect, this was a rewarding chase trip. 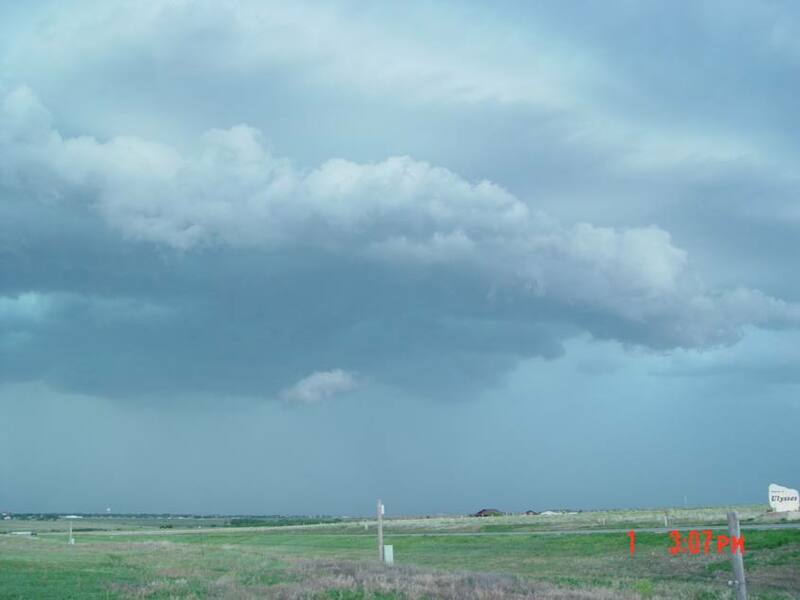 In restrospect, the pattern was not very favorable, yet we managed to squeeze out three days with tornadoes, three other days with supercells, and one day with a squall line embedded with supercells, and a possible tornado. All a storm researcher can hope is that he or she will have a few opportunities to view storms, and to have the good fortune to make the correct decisions to maximize these opportunities. This is indeed what happened this year. Thanks go to the colleagues with whom we/I chased...Chuck and Vickie Doswell, Matt and Betsy Crowther, Steve Hodanish and others. See you again next year.